The London Youth Games is Europe’s largest youth sports competition, inspiring young Londoners for over 40 years! It involves each London borough competing against one another across 30 different sports. Enable Leisure & Culture coordinate the entry process including trials, competitions and training programmes for Wandsworth teams. Please note this is for open competitions for anyone going to school or living in the borough. If you are interested in representing Wandsworth in this years competitions, please complete the registration form below. You can also find a list of trial dates and eligibility checker for each sport. 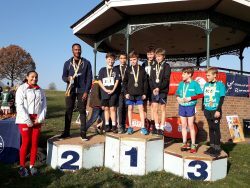 The 2019 competition kick started in November 2018 with the Cross-Country competition. Wandsworth did incredibly well and received silver overall for both the boys and the girl’s team. More recently this year the cricket qualifiers were held, and Wandsworth girls team qualified for the finals which were held at Lords. Our Para Games sports started in March with Boccia at Westway where they narrowly missed out on qualifying for the finals. For more information about London Youth Games, contact us on 020 3959 0032 or email us. For more details about the Games please visit www.londonyouthgames.org. To see all the photos of previous events visit our facebook page.